The 2017 Ford Explorer performance features accentuate the amazing capabilities that this SUV possesses. Drivers throughout the Glenwood Springs region don’t need to worry about inclement weather or troublesome terrain thanks to the innovative Terrain Management System™, host of performance dynamics, and supercharged engine options that can seamlessly take on any challenge. Towing and ground clearance numbers are make this a valuable automobile, and its fuel economy is quite impressive for its segment. 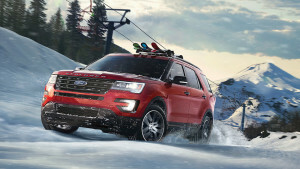 Learn more about the 2017 Ford Explorer performance features, then head to Glenwood Springs Ford to experience them in person! Stop by and see us at Glenwood Springs Ford to check out the 2017 Ford Explorer performance features! We’re located at 55 Storm King Rd. and are open Monday through Friday from 8 a.m. to 6 p.m., and on Saturday from 8 a.m. to 5 p.m. Message us online if you want to learn more before visiting. Even make an appointment in advance so you’re ready for that test drive right when you arrive!